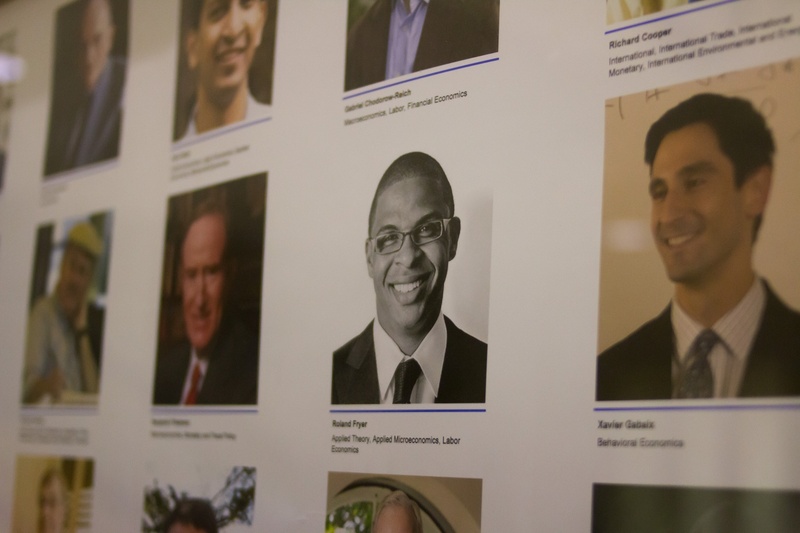 A headshot of Economics professor Roland G. Fryer, Jr. among other department faculty in the Littauer Center. More than 285 graduate students and research assistants — at least 18 of them at Harvard — signed a letter Thursday calling for changes within the field of economics in response to allegations of sexual harassment against Economics Professor Roland G. Fryer, Jr. The signatories asked economics departments at universities across the country and the American Economic Association to implement a set of three changes — to better listen to graduate students, create codes of conduct, and implement a reporting system to “document bad behavior.” At least two former research assistants at the Education Innovation Lab — the think tank Fryer founded — signed the letter. The Crimson first reported the existence of at least one Title IX investigation into Fryer in May, and another in December. Fryer is the subject of two additional Harvard-led investigations — one into allegations of sexual harassment and one into his lab’s finances — according to the New York Times. He also faces a state-level investigation led by the Massachusetts Commission Against Discrimination based on a complaint filed separately by one of the Harvard complainants. Multiple complainants allege Fryer engaged in unwelcome sexual conduct towards female employees and created a hostile environment for women at EdLabs. In a May interview with The Crimson and a December op-ed published in the Times, Fryer denied the sexual harassment allegations against him. Harvard’s Office for Dispute Resolution — which conducts investigations into formal complaints of sexual- and gender-based harassment — issued a report this fall on one investigation, but at least one other ODR inquiry remains ongoing. Several months after The Crimson’s report, AEA members elected Fryer to the association’s 2019 Executive Committee — a position held in the past by several Nobel Prize winners. In October, the current committee said in a statement they believed many members voted while unaware of the allegations against Fryer. Following growing calls for his resignation on social media, Fryer resigned from the committee on Dec. 18. University of Michigan Ph.D. student Evelyn A. Smith said she drafted the letter published Thursday earlier this month after reading about the allegations against Fryer. She then worked on it with a group of economics students advocating for diversity within the field, who distributed it more widely. Smith said she thought graduate students signed the letter because they are in a “vulnerable” position within academia. In the letter, students wrote that widespread problems in economics have pushed their colleagues to leave the field. Of the students who signed the letter, 75 had chosen to remain anonymous as of Thursday evening — some of them Harvard affiliates. Smith said she thinks this is evidence of graduate students’ precarious position within their departments. “The recommendations of this letter are not controversial. We’re asking for basic workplace protections. So the fact that 72 or 73 people felt like they couldn’t publicly say that they support these workplace protections should send a signal to our field that things are really bad,” she said. Harvard Ph.D. student Megan R. Bailey wrote in an email that she signed the letter because she thought it offered straightforward solutions for the field of economics. “The suggestions in the letter ask for common-sense incentives—precisely the policy solutions economists are trained to create to improve welfare. In a time when misconduct is being revealed in many professions, this is exactly what we need: policy solutions,” Bailey wrote. Ph.D. students Kathryn A. Holston and Anna M. Stansbury, who lead Graduate Women in Economics, wrote in an email they have had “very productive meetings with department leadership” and support the suggestions in the letter. Fryer and the AEA did not respond to request for comment on the letter or the recommended changes.